I am a single mom and this is my first year taking care of the pool. I notice a small section where the wall has pulled away from the column about 2 inches. Don't know if I am using the correct terminology. Can this be hammered back into place? Do I have to drain completely? Also there is a cable wire around the pool under the overhang. It is well under in most spots and hangs a bit in some other spots. Is this something needed for the pool? Or is it for the pool cover? When I put the cover on last year I used rope. However, I am now thinking that maybe this cable comes apart somewhere and is for the cover? Hi Eileen. I would guess the cable is for the cover as there is no cable needed for an above ground pool structure. As far as the wall pulling away, I would just keep an eye on it, it's probably not a big thing. Without knowing for sure what the problem is I would recommend not using a hammer on it. 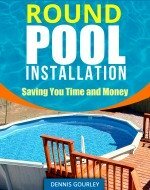 Is it dangerous for an oval above ground pool to come out of the plastic track? Can I put some dirt on the wall and hope that will hold? Or do I need to drain the pool and put it back into track? Hi Peggy. It is impossible for me to know just how bad it is without seeing it, however, the wall coming out of the track is never good. Mounding dirt around the outside will probably work as long a you use enough, a few inches will not likely make much difference.